with gold finished counter-sunk brass heads to fit. Round bend. Down-eye. 2x wide gape. Triple Finish: bronze/nickel. 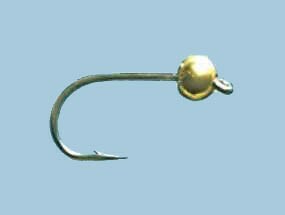 Uses: Bead Head Wet flies, Extra Long Nymphs, Mini-Lures, Mini Muddlers. 25 per packet.